I first saw Roy Davis with his band Roy Davis and the Dregs on my 28th birthday in 2008 at One Longfellow Square. They opened for a band I absolutely love and miss dearly since they split to go solo—the everybodyfields. I thought Roy was great and bought his album “Dead Weight” that night and have listened to it often. Here’s a link to all things Roy Davis and The Coloradas where you can check out all of their music. When the days are short and light is limited, knowing there will be cute boys playing instruments on a Friday night makes it an easy sell to get my teacher friends to stay out late with me. My friends Michelle and Audrey readily agreed to join me at One Longfellow Square to see This Way and Roy’s new project, The Coloradas. I was frankly expecting more flannel. There were a lot of thermal shirts, though—I’d believe it if someone said LL Bean had sponsored the show. Check out The Coloradas’ official video for “Crooked Youth” here to get a taste of what they’re up to. 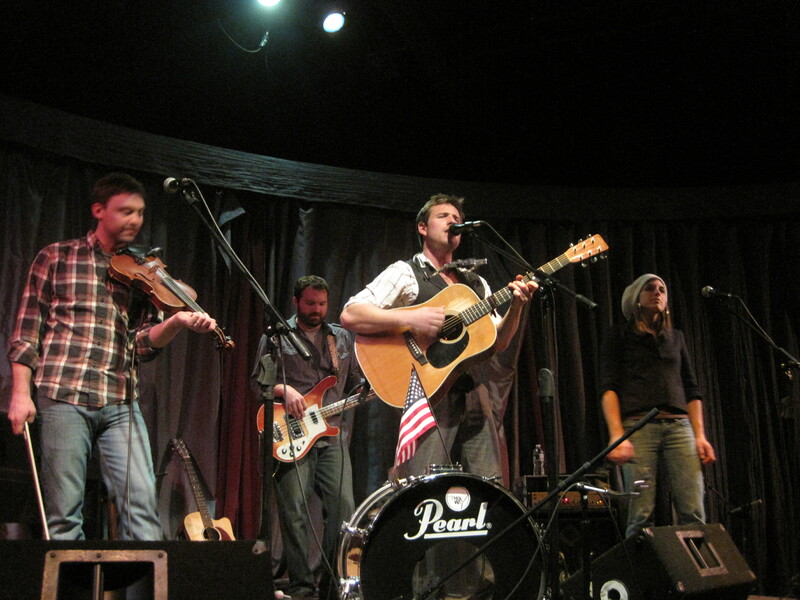 I had never seen Portland-based Americana band This Way before. They were great. You can check them out at their website. Lead singer Jay Basiner had a lot of good energy. He claimed to be feeling a little under the weather, but I wouldn’t have guessed it. He said he’d played a little too hard at Sugarloaf and he was paying the price. He joked about how wrestler Bret “The Hitman” Heart had won a WWF championship with a 105 degree fever, so he’d push through. Having grown up a wrestling fan (am I admitting this?) with a poster of the Ultimate Warrior on my wall until high school, I was amused. Their drummer was away at another gig, so Jay played a lot of foot percussion while also singing and playing the guitar and harmonica. I was impressed. I thought their harmonies were beautiful and Andrew Martelle rounded out the sound with his captivating fiddle and mandolin playing. 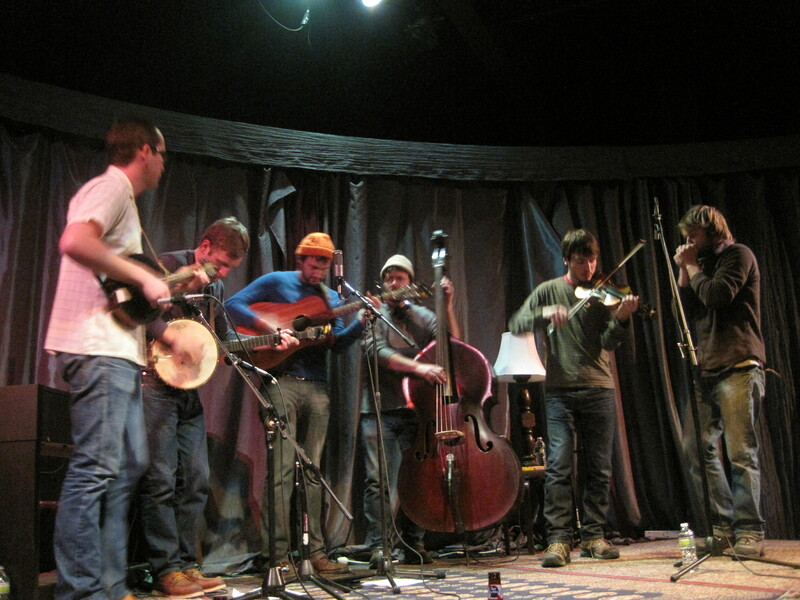 They had a full sound, and played a mellower set that fit well in One Longfellow’s intimate listening room. I especially liked “New York City,” “Balance Beam,” and “Take It All (Or Leave It All Behind)” from their album “Goodbye Forever” that I named my own price for when I downloaded it from their bandcamp site. This Way also has a YouTube channel where you should check them out. I especially like their rockin’ version of “Take It All (Or Leave It All Behind)” from their “Goodbye Forever” release show in 2011 at Port City Music Hall. This Way will be playing with Boston’s Kingsley Flood (I graduated from Bowdoin with their lead singer) and Tricky Britches at Empire Dine and Dance on February 25th. After the fastest breakdown of a stage I’ve seen in ages (James from OLS rushed to be sure we’d all be out by the 11PM parking ban), The Coloradas took the stage. 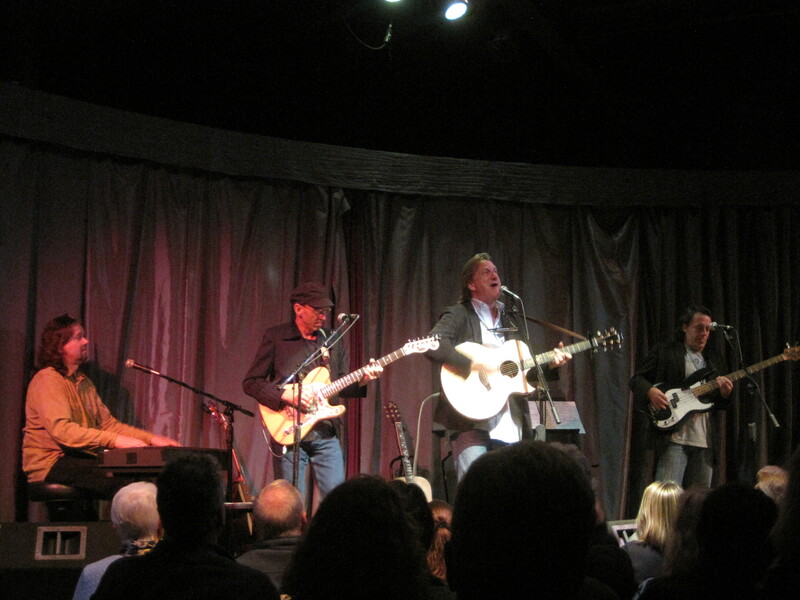 This was the night of the debut of their self-titled album featuring Roy Davis, Bernie Nye, Joe Walsh, Steve Roy, Amanda Kowalski, Calvin Goodale, and Jon Nolan. Not all of those musicians were present, but they were joined by members of The Stowaways and Tricky Britches—all fine musicians. One Longfellow was quite full that night, but up until then, we’d been a very quiet, attentive audience. Roy broke the ice. He is self-deprecating and funny. We laughed a lot. Bernie nearly poked Roy in the eye with his banjo (the band really squeezes in around a single mic) and Roy joked that he was sorry if he “sprayed head blood all over” us, and that he tries to “say head blood once a show.” We chuckled. It was appreciated humor. I really liked the first two songs from their album that they played first that night—“Misery” and “This Isn’t Love, Natalie.” The blend of mandolin, banjo, guitar, upright bass, fiddle, and their vocal harmonies were great. Many women would probably be interested in “This Isn’t Love, Natalie”—it goes, “and standing in the rain I felt like singing all my songs for you/But this isn’t love, Natalie/It’s never love until I leave you my key.” Oh, and the guy in the song does eventually give her his key—and then promptly runs away. A torturous reminder that apparently men really are from Mars and women are from Venus and we see the same things so differently. I’d like to hear Natalie’s version of the song. “Down On My Knees” sounded great. If The Coloradas ever start telling stories about what these songs are about, I’d be curious about this one and “Know Your Enemy” and “Enid” for that matter. They had a friend join them who played a mean harmonica. I was caught a little off guard by “How Little You Needed Love.” It’s heavy, like a lot of their songs are, I think. The chorus is “and when you’re dying it’ll feel good to know/You were alone then/You’re alone now/You showed them/How little you needed love.” I’m sure that song has quite a backstory. The band finished up the night with “Eight Ball Blues,” but the previously quiet crowd stomped and hooted for an encore and the guys obliged. I’m sure everyone there that night is already excited to see both groups again. I certainly am. I bought the The Coloradas’ debut CD after the show and have listened to it a lot over the past week. I really, really like the album. Every song is good. Bernie’s song “A Brand New Day” is a lovely interlude halfway through. I love his voice—he sounds like an old man in the very best way possible. The lyrics on the album are sometimes simple and straightforward and it’s easy to imagine the story, but sometimes I have almost no idea what’s going on. It keeps me guessing, and I like that. I’ll be ready for more stories about what these songs are about the next time I see The Coloradas. Sam Pfeifle from The Portland Phoenix wrote a good review of the album and you should check it out. Pick up a copy of the album, too. Last week was a hard merge, but I went to see Jacob Augustine anyway. Brave girl. I called for a much needed Girls Night and Sophie, Michelle, and Rachel responded heartily. We met for dinner at Duckfat and minus Rachel, headed over on icy roads to St. Lawrence Arts Center on Munjoy Hill in Portland to see Jacob Augustine play two acoustic sets. I’d never seen a show there—it’s a converted church and has a beautiful wooden ceiling and riser seating. It feels old and intimate and lovely. I’ll be going back. Check out their website here. Sophie and I saw Jacob open for Billy Libby in September at One Longfellow Square, and my best friend from high school, Meg, and I saw him at the Belfast Free Range Music Festival in April of 2011. I am a fan. We nestled into the center of the crowd and Jacob came out a little earlier than expected so he could finish up the show before Portland’s 10PM parking ban. Jacob opened with “Waco,” a haunting song (I could say that about a lot of his songs, actually), and I love the juxtaposition that is Jacob Augustine. He is a burly guy with tattoos, a huge beard, and a shaved head who belts out in this falsetto voice that catches listeners off guard. One of the things I like about Jacob’s simple, yet also quite complex songs are the wailing “oo”s and “la”s—they make his songs complete and are as interesting and intricate as lyrics. You can read more about Jacob Augustine in this Maine Magazine article. Maine Magazine is one of my very favorites and they were one of the sponsors of the evening. Jacob plays classical guitar—his simple strumming and chord progressions are a good backdrop for his powerful, heavy lyrics. His songs would make a beautiful film soundtrack. I’d also love to hear him harmonize with a female voice. I think it would be amazing. Jacob played a beautiful rendition of “Methadone.” It’s a love song—it starts out “And without your love, I shake, shake, shake/I need you in my blood/And I love you every day/Yeah, I wake up/You’re always there to save me.” For about the first thirty seconds, I forgot that it’s really a love song FOR methadone. Being from northern Maine, Jacob addresses the turmoil and chaos drugs continue to cause in our beloved state. It certainly sounds like he knows what he’s singing about. Jacob called himself a “quiet man onstage” and I agree, but I liked hearing the background behind one of the songs, “Catalina.” He talked about an accident in a field in high school where a friend was run over and he literally lifted the car up off of her so she could be extracted. She was in a full body cast and had a long recovery. Later, her mother overdosed, and a week after that, so did she. I love knowing what songs are about, and I had this brief moment where I thought it would be great to hear a Jacob Augustine storytelling session, but I quickly changed my mind. Some (most?) of his songs are heavy and about very serious, troubling, difficult things and I’m not sure how many of the back stories I could handle hearing. I imagine songwriting is one of the ways he processes those difficult times in his life. Music is good therapy for all of us. “Coyote,” from his Frontier album, is one of my very favorites and I was happy to hear it. “Asthma,” also from Frontier (I think that’s my favorite of his albums), was stunning—his patient refrain of “it was so good to see your smiling faces” was intense and the somehow already silent room got quieter. By the end of the evening, I was sufficiently lulled and ready for bed (Friday nights are SO not the right night for this teacher to be out on the town!). Jacob closed with another of my favorites, “Peace Comes.” If you can carve out six minutes in your day, I’d really recommend listening to this beautiful, collaborative version of “Peace Comes.” The message that “peace comes—I promise, I promise/Hold on” was the right note to end the night on. There is something primal and urgent yet so gentle and simple about Jacob’s songs, and about the singer himself, as well. I am caught in the juxtaposition and will happily linger there until I see him again. Jacob’s albums are available at his bandcamp site. You can name your own price to download his music. I hope you’ll check him out! I am often in need of a concert buddy. Let me know if you’re interested in joining me at any of the following, or at least check out some of these great artists I’m excited to see soon! Katie Herzig at Empire Dine and Dance in Portland on Friday, March 16, 2012 (http://www.youtube.com/watch?v=qI2k7R65EZY) I can’t be there, so if you go, please tell me about it. I am SO SAD to miss Katie–she is amazing! A Happy New Year with Ellis Paul and Friends! I love Ellis Paul. No one who knows me will be surprised to hear that he is my favorite musician touring today. I first saw him at Pickard Theater at Bowdoin College (my alma mater) in Brunswick, Maine on March 30, 2002 at the recommendation of one of my friends from Bowdoin’s Residential Life staff. I was hooked. Ellis is a phenomenal songwriter. He writes in a narrative style that makes listeners feel like we are right there living in whatever vignette he’s exploring in his song. I knew immediately that I wanted to see Ellis again and again, and I discovered that he plays back-to-back New Year’s Eve shows every year at the incredible Club Passim in Harvard Square in Cambridge, Massachusetts. I’ve attended his New Year’s Eve show there seven times with fabulous friends. It’s surely been one of my favorite traditions in my life. This year, though, my friends and I were not able to make the show together. Our friends Lizzie and Dave welcomed their first child into the world just weeks before the Club Passim show—welcome, Caroline! This year, Ellis on New Year’s Eve was not to be. Ellis and his friends Radoslav Lorkovic, Don Conoscenti, and Michael Clem have played at the intimate and fabulous One Longfellow Square in Portland, Maine on New Year’s Day for the last two or three consecutive years. 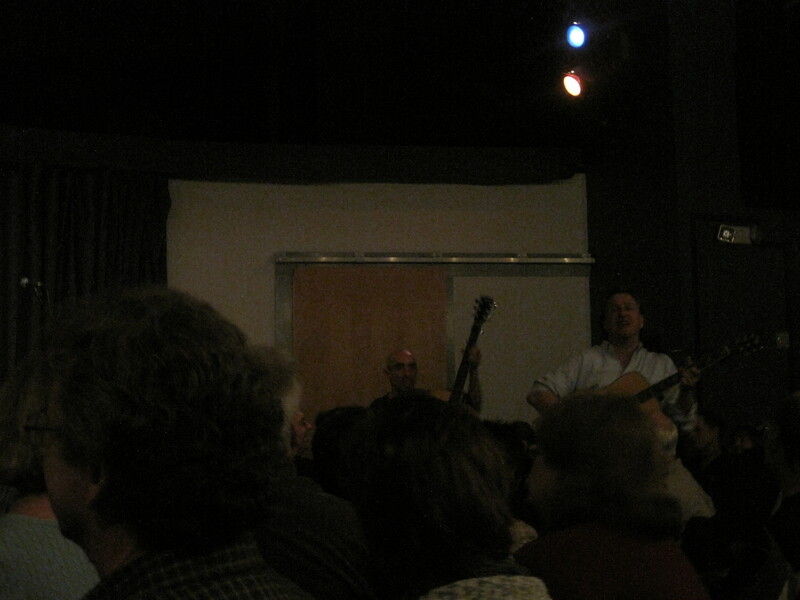 One Longfellow Square is a beautiful, small venue and is now a non-profit and I’m a member. I was really happy to be able to see Ellis and friends at OLS so close to home to start off my year. Check out One Longfellow Square here. You won’t be disappointed! My friend Michelle and I grabbed a great Thai dinner before the show and were joined at OLS by Jason, Max, and Sophie. We got there just after doors opened and were only able to get five seats together in the sixth row. The show was sold out and people arrived early to get a good spot. Ellis is a Maine favorite as he’s a Maine native living far from home these days. When Michelle and I found seats, the woman sitting in front of us with her family was quite chatty. She had also seen Ellis a month or so before at Slates in Hallowell, Maine (just four miles from my house)—a show Michelle and I had also attended. She was so excited to see Ellis and called herself his number one fan. At some point, though, it came out that this was my 37th Ellis Paul show. I was dubbed “Ellis’ number one fan.” Any Ellis fan reading this obviously knows I am not his number one fan. He has quite a lot of people who claim that title and I am happy to share! 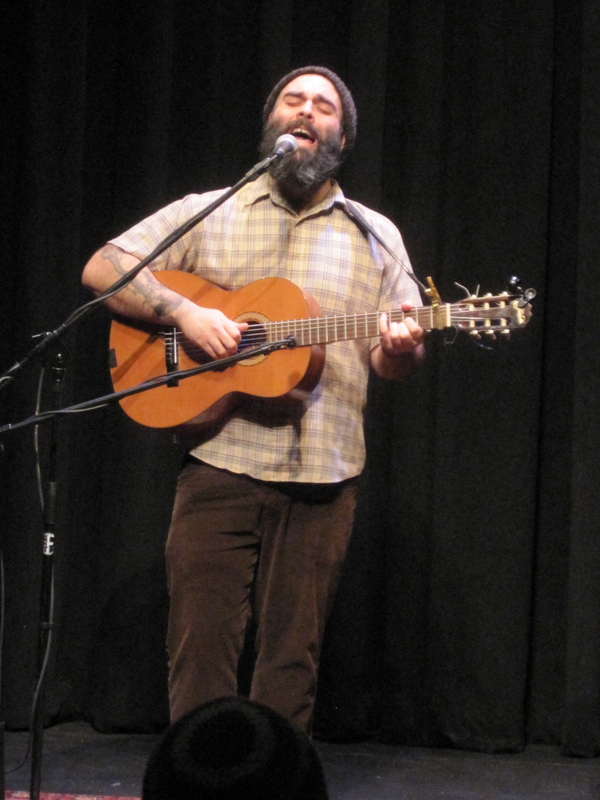 Peyton Tochterman, who Ellis discovered playing at a wine bar in Virginia, opened the show. We’d seen him in November, too. He reminds me of Maine musician, David Mallett. He exudes country—songs of villain/heroes and love and loss. He was significantly more entertaining on this night—I think he’s hit his comfort zone touring with such seasoned professionals. He told a hilarious story about his neighbor who bought his daughter a rifle for her fourth birthday. I promise the story is funnier than alarming. He also said his neighbor (the same one, I think) has a tattoo of a JEEP with the word “JEEP” tattooed underneath it. He asked if Mainers could relate and a woman in the front row said she’d gotten a pink rifle when she was younger. Peyton also told the story of how he written the first part of his album while recovering from surgery after Kenny G’s piano fell on him when he worked as a roadie. Yes, really. He has a sense of humor about it now, saying it couldn’t have been Elton John’s or Billy Joel’s piano but Kenny G’s. He was in a dark place when he wrote his EP—good fodder for country/folk music, really—and when Ellis heard him at the wine bar, he offered Peyton songwriting help and really pushed him to record and mentored him through the creation of a full-length album. Ellis, Rad, DonCon, and Michael Clem took the stage after seven shows in three days. They were no worse for wear and put on a great show. They played “3,000 Miles” and “Maria’s Beautiful Mess”—Ellis classics—but also a couple of new songs from Ellis’ just-released family album, The Hero in You. I really, really like the song about Chief Joseph and love the concept of intelligent songs for kids about important people like Rosa Parks and Benjamin Franklin. He also played a newer song about Johnny Cash called “Kick Out the Lights,” which is my friend Michelle’s favorite and has a great audience participation part. The ongoing story of the night was about an incredible and expensive guitar that Ellis had played for a couple of shows but decided it would be crazy to buy. Later, when he decided to go for it, the guitar he loved had just been bought by Neil Young for his wife. Fast forward to another fabulous and expensive guitar in Oklahoma that Ellis played during his shows there. When the owner told him Neil Young was coming in soon, Ellis pulled out his credit card and bought the guitar (which he was playing at the OLS show). When Ellis broke a string and proceeded to fix it himself during the course of a song which he continued to sing without missing a beat, Michael Clem hollered out “I bet Neil Young couldn’t do that.” A lot of camaraderie on stage that night. As per tradition, Ellis and the guys unplugged and came out to play in the audience— they did “The World Ain’t Slowing Down” in the audience and wrapped up the night back on stage with “Annalee” and “Hurricane Angel” as an encore. It was a beautiful night, a great start to 2012, and I’m excited for my 38th Ellis show! This is suddenly real. I have been meaning to start this project for a while now. 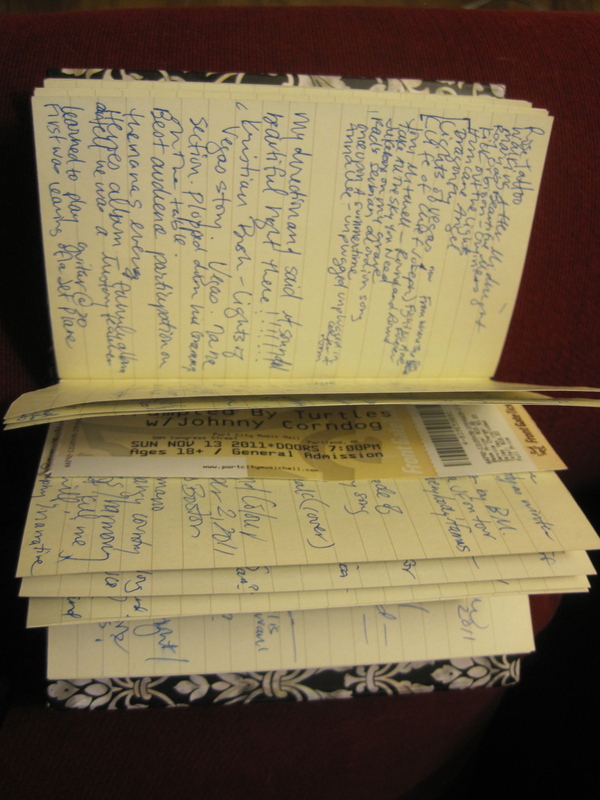 I actually started taking notes at shows and wanted to start blogging about them in mid October of 2011, but I was so busy seeing shows (17 from that point on, in fact), I didn’t make time for the writing part. I figure starting fresh in 2012 and doing a show at a time is more doable.